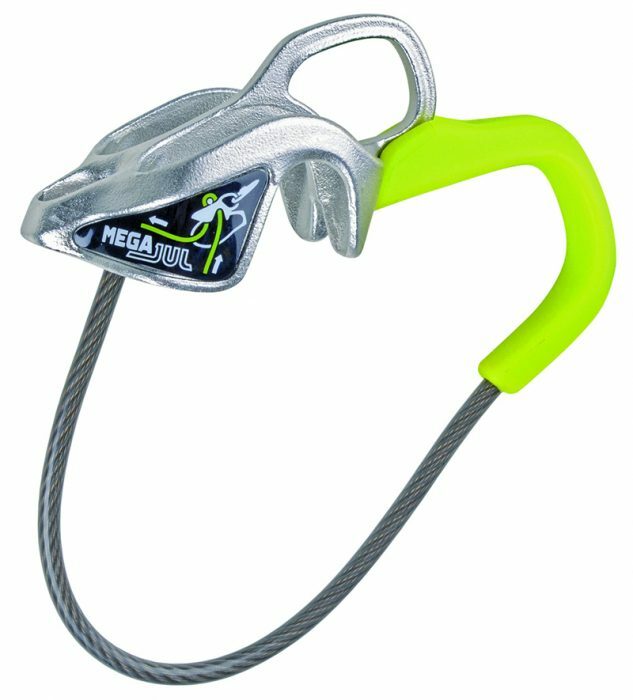 Durable and multifunctional, at least once figured out, Edelrid’s Mega Jul belay device helps rock climbers be safer and more efficient. The Ederid Mega Jul is one of the smallest, most compact and versatile belay devices available for rock climbers. It operates in two modes—as a standard “tubular” device and as an “assisted-brake” device. The Mega Jul came to market in 2015, and its “assisted-brake” design is unique. 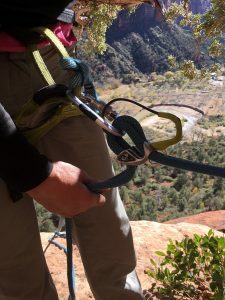 A groove in the device’s body locks down hard on a locking carabiner and rope when it’s loaded. 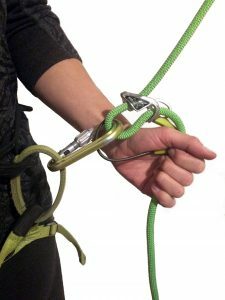 This provides extra friction, helping a belayer catch and hold a fall. 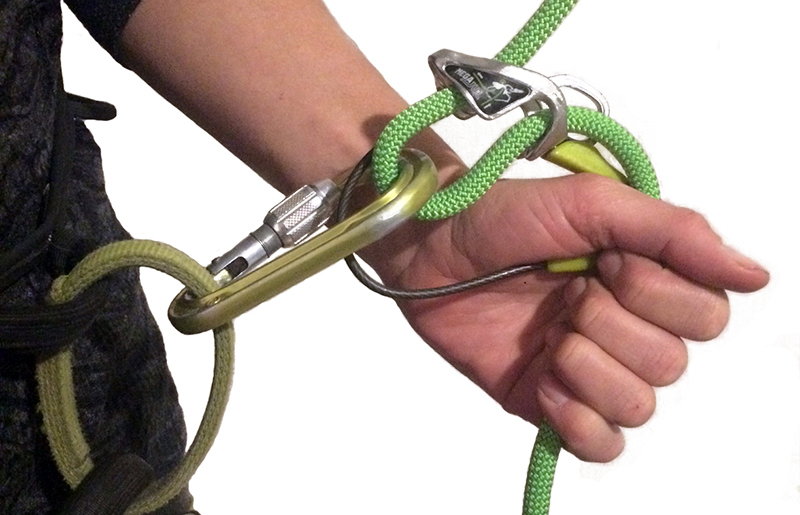 A keeper cable with a plastic-coated thumb hook then allows the belayer to lever the device at different angles to control and release the rope. This is not a device for beginners and isn’t intuitive to figure out (watch the online videos!). In fact, it frustrated me so much that I didn’t regularly carry it until I lost or wore out all my other devices. However, now with some practice, I believe it’s the most secure device I’ve ever used. Super compact and weighing just 2.3 ounces, I barely notice this belay device on my harness. Plus, despite using it in often harsh environments for well over a year, I’ve yet to see even a slight wearing of the metal. The company says the device’s steel construction ensures it will last two solid years with intense usage and ten years with minimal. I don’t doubt it. It’s a solid all-around device. You can rappel with the Mega Jul in various ways. Just be sure to employ a backup prusik knot when not using it with the thumb hook facing away from you. I started using the Mega Jul the same time I started climbing with the 8.9mm Edelrid Swift Pro rope, and I found myself flying down the line faster than I liked. Now I always use it with the thumb hook facing away from my body; it’s fairly effortless to lever the device while rappelling in this manner. You can also clip a carabiner to the small hole in the device’s nose end and use it like a Grigri lever. It functions like other, similar devices (Petzl’s Reverso and BD’s ATC Guide) when used in “guide mode,” though it regularly took me longer to orient and feed it correctly because the configuration of the device is slightly different. Where To Test It: Any rock or alpine adventure. I can’t attest to its functionality in icy or snowy conditions, as I’m not a cold-weather climber. Boring But Important: I always use the smallest locker I own because I like to climb as light as possible, but because of the Mega Jul’s narrow notch, slippage happens. The device functions better with a fatter locker, such as the Petzl Attache or Edelrid HMS Strike Screw FG. Edelrid recommends you use an HMG Bruce Steel FG (weight 4.7 ouches) instead of aluminum to optimize the longevity of the system. 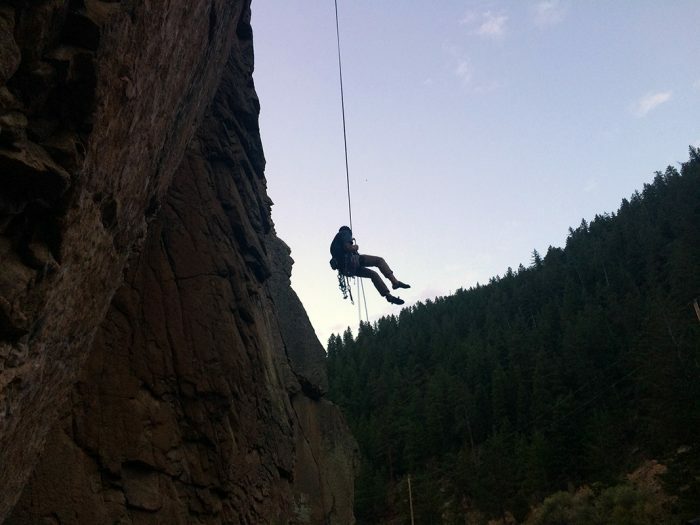 Consider using gloves to belay and rappel to avoid rope burn as you’re figuring the Mega Jul out. Depending on how you use it, you might find the rope runs too quickly through the device. Flaw: The friction from the assist can be a pain; at times you will definitely need to use some muscle to pull up on the thumb hook to release the device and lower the climber or yourself. Don’t use with fat, fuzzy ropes. First Impressions: Tricky to figure out. Lasting Impressions: Awesome! Streamlined, compact, ultra lightweight, and super durable. Who Should Buy It: Guides, trad climbers, and alpine rock climbers who want to carry less weight. The Mega Jul is not intuitive. I recommend you watch the instructional videos and spend time with it in low-commitment scenarios before using it in the backcountry. Despite a rocky start, Edelrid’s Mega Jul is now my belay device of choice for all alpine and multi-pitch rock climbing. It is a light, small, durable, and multi-function device. The added security of its bomber, near foolproof assisted-braking component is reassuring on the mountain and the rock.